As soon as I switched over from Fox to CNN last week the first thing I saw was a giant countdown clock to the next government shutdown. End times over at CNN apparently. Of course we all know by now that a national emergency was announced by Trump and that’s the end of that shutdown nightmare fuel for CNN. SOMEHOW they found more to report on and the front page moved from U.S. political story to U.S. political story all week long. The justice department is preparing for the Mueller report early next week. Trump’s name showed up eighty-two times on the front page throughout the week and AOC wasn’t mentioned once. Dramatic different from Fox. There is no comments section at the end of each article on CNN like there is on Fox. They started phasing out comments section in 2014. This is probably a good thing and Fox should really consider following suit since their comment section has become a place to breed hate and misinformation. Overall, nothing unexpected happened on my week over at CNN. I knew the kinds of headlines I was going to get because I usually hop onto CNN a few times a week in my daily life. It was fascinating though to see it from a perspective of just coming off of Fox News. In Fox world, everything is fine in America and the only problem we have is the liberal socialist agenda, illegal immigrants and terrorists. On CNN, the only problem we have is Trump and his racist, homophobic, sexist followers. Both of them get it so wrong it’s not even funny. It’s just plain sad, and the real truth out there is that it’s all click bait. What do conservatives want to read and what do liberals want to read? How do we get them to come back to our site? How to we continue to fuel the outrage that gets people to read the news? And how to do continue this on and on in order to get more views, more clicks and ultimately more money. According to CNN Trump has been on his way out of the white house via impeachment ‘any day now’ for the past two years. I’m bored with this narrative. It’s just not going to happen. CNN has more categories on the surface. Fox has a radio tab, a method of news they dominate in and a ‘Fox Nation’ tab, which is a subscription based service if for some reason you feel you aren’t getting ENOUGH Fox in your life. The lifestyle tab on Fox is really just a celebrity, travel, feel good, viral video dump, but to be fair, CNN’s style, entertainment and health categories offer the same. I read an interesting book for this week’s challenge. 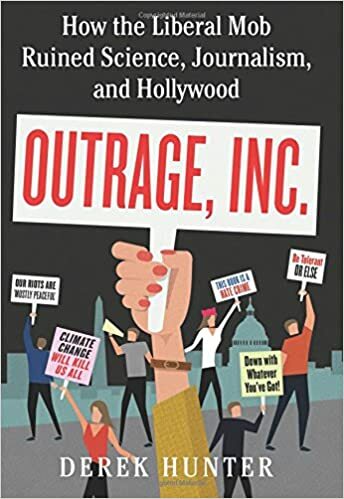 It was called Outrage, Inc. by Derek Hunter. I knew going in that this was a right leaning book and there was quite a few things in it I did not agree with (particularly his views on gender, college students, and ‘snowflake’ children), but I came away with questions and a desire to do my own research on a few subjects. For instance, have you ever quoted to someone who doesn’t believe in human caused climate change that ‘98% of scientists agree it’s happening’? I definitely have. Well have you ever looked into where the study came from? Who funded it? What scientists did they poll the information from? Just something to consider. We spout information so fast these days like we’re all experts on whatever subject, but are we even really looking into it that hard? Maybe we should. If there’s anything I’ve learned so far this month that I want to instill in everyone is to QUESTION EVERYTHING. Everything you read, everything you hear, everything you see. How is it being curated to you? Is it being portrayed in a way that makes you want to click, to share? Who funded this study? Who wrote it? Why? And finally, let’s try to be more open to listening to the other side. We cannot live in a feedback loop that constantly reaffirms our believes. Go beyond the headline. See that there’s more to a person than who they voted for. People are complicated and they aren’t all just one thing. Before I move on I want to announce that I finally found out about Venezuela this week. It’s something I heard just a bit on before doing my week long black out, then Fox didn’t have anything for me on the subject so it’s been driving me crazy. It made the front page of CNN two days into my CNN week. The headline was just that Venezuela closed key maritime and air borders with its neighbors amid growing aid crisis. In this piece I finally learned that the biggest issue is President Maduro won reelection and a lot of countries including the U.S. see it as a fraudulent election and are supporting self-declared interim president, Juan Guaido. We are apparently working with Brazil at the moment to determine logistics in providing food and medicine to the people to Venezuela. This is kind of a big deal and still no one is talking about it around me at all. Sounds about right. In the United States, it seems the only news is United States news. I’m really excited to get to next week and start looking into some world news.